I approached the design of Sasha the same as Sigmund. 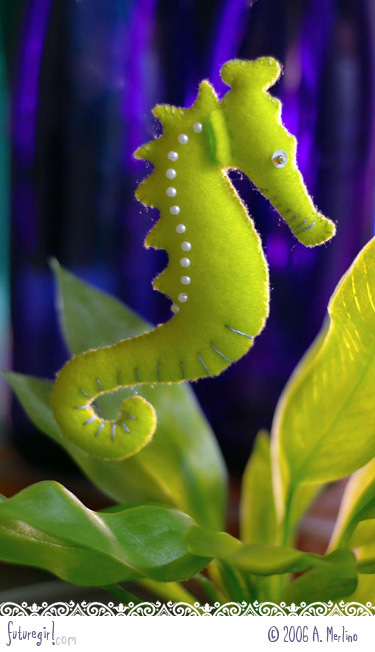 I did a Google search for seahorses and studied all the different seahorse features. I never realized how truly bizarre these creatures are. The more you look at seahorses, the weirder they look, just like a word sounds weird if you repeat it over and over. 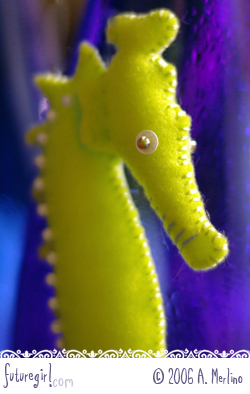 Seahorses are very very elaborate, so I had to really pare down the design to basic elements. I used the periwinkle stitching and the pearl beads to mimic their exoskeleton-looking bodies.